More and more governments, corporations and organizations are hiring Canadian keynote speaker Grace Cirocco to help create learning and enrichment opportunities for their staff and members, whether it is at an annual professional conference, seminar or retreat. All of her dynamic keynotes are customized to meet –and exceed– the needs of your group. Grace Cirocco is a much sought-after motivational keynote speaker, workshop facilitator, women’s retreat leader, and couple’s retreat leader. Author of the best-seller Take the Step, The Bridge Will Be There, Grace appears regularly on television and radio. Her clients include Fortune 500 companies, women’s organizations, government agencies, educational institutes, non-profits and high-profile international firms. All keynote speaking presentations can be presented as a 1 or 2 hour, 90 minutes or as half-day or full-day interactive workshop & keynotes. The following are examples of some of the keynote presentations that Grace Cirocco can deliver. 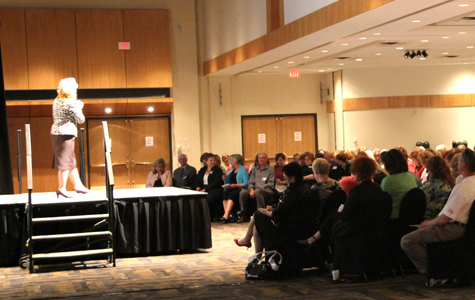 Each and every keynote is tailor-made to fit the needs of your group or organization. What dreams have you postponed? What “undones” do you have? What do you really want? These are just a few of the questions Grace will get you to think about in this thought-provoking and stimulating keynote. And then, why do some people take the step and succeed while others take the same action and fail? The secret is belief. Grace will share all the secrets from her best-selling book by the same name now available in countries around the world. Research shows that most women don’t sleep well because their brain never shuts off. Rather it “expands” to include everyone and everything often leaving her overwhelmed, angry and empty. In this presentation you will learn 13 tips for getting it all done without losing yourself including the latest research on the female brain, how to identifying priorities, how to surrender without losing control, mastering the Four Time Quadrants and much, much more. Leadership practices are evolving. Making work meaningful, creating value for all stakeholders, sharpening our attitudes towards change and knowing how to inspire and motivate a team are items on the leader’s agenda. Today, leadership is not about position-it’s about action. And in order to take effective action, we need a great vision. In this keynote presentation, you’ll be inspired to cultivate the leader within you. There is a new breed of leader on the horizon, one who has the courage to look within to find something real and authentic. Leadership is about knowing yourself first and then being able to communicate vision, strategy and enthusiasm to the team. It’s about producing results in a climate of change; about aligning effort with compass and making sure that communication flows between all the different stakeholders. Leadership is the responsibility of all those who want to make a difference, who want to contribute to a larger vision and succeed. Grace will share the 3 C’s (Confidence, Courage and Compassion); the stuff that all authentic leaders have. In this empowering keynote, you will learn the skills to grow these characteristics in yourself and inspire them in others. The Center for Creative Leadership reports that most people fail not because of technical inability but because of “an interpersonal flaw”. Today “hi-tech” may get you hired, but it is “hi-touch” or “emotional intelligence” (EQ) that keeps you employed in the new economy. The good news is that EQ can be learned. Grace will engage and entertain you as she shares which emotional competencies contribute to leadership excellence in this very powerful keynote. The facts are simple: more and more people are being asked to do more for less; change and “re-structuring” erodes employee self-confidence and affects morale. People go to work, but leave their creativity, enthusiasm, in short, their soul at home. In this motivational keynote, Grace teaches how to re-charge your spiritual battery, how to bring passion and enthusiasm to your life, so that you can be more motivated and effective at your work. Do you secretly ache for something more? Do you celebrate the miracle that is your life or are you constantly running, frustrated by the never-ending to-do list at home and at the office? If you’ve ever wanted more passion, purpose and potential in your life, then you’ll enjoy the practical wisdom and innovative strategies in this keynote presentation. Grace Cirocco’s passionate delivery and contagious enthusiasm will awaken your Spirit to outrageous celebration and purposeful living. Passionate people are enthusiastic and alive in every sense of the word. They’re leaders. Their attitude is contagious and they motivate everyone around them. They’re connected to the big picture and to the mission of the organization. The truth is that every great idea, project or movement was born out of a passionate, enthusiastic exchange, a dialogue. Turn your whole team into leaders as Grace inspires them to communicate from their authentic depths and challenge their limiting beliefs. In this hands-on, inspirational workshop, you’ll learn how to confront your fears (DARE); use your imagination to stretch into new possibilities (DREAM) and come up with an action plan to achieve your goals (DO). What have you wanted to do but keep postponing? What goals have you given up on? What “undones” do you have that when you think of them make you feel bad? This presentation will inspire you to “raise the bar” on what you expect from yourself, on what is possible and on delivering excellence in your professional and personal life. Self confidence in individuals is eroded in a climate of extreme change and so professional excellence is compromised. Help your staff reconnect to their power, their talent and their inner voice that says “yes!”. Self-confidence is fundamental because it acts as the immune system of the mind. It allows you to trust yourself so you can take risks and keep moving forward. Learn the secrets to raising confidence by plugging into the “outrageous factor”. Grace dazzles audiences with this high-energy and empowering keynote presentation. The personal wellness of the individual is the building block for the growth of the organization. Today as the engines of change force us to do more for less, and companies and governments continue to restructure, a greater interest is taken in the individual’s coping mechanisms. In this keynote presentation, Grace will share with you what she’s learned about staying resilient and about wellness from the inside out, providing ideas and strategies for the mind, body, heart and soul. Research shows that personal success is based upon the health of your relationships both personal and professional. The two most important “C’s” in any relationship are Credibility and Compassion. These two “pillars” are the foundation for any healthy relationship. Credibility opens the door to trust and integrity, and compassion awakens the heart to make a connection with the emotional brain. Conflicts or communication breakdowns happen when credibility has been challenged or when we forget to see people through our lens of compassion. Learn the 7 most powerful ways to build credibility and 5 Aspects for Growing Compassion so that you can transform even your most difficult and challenging relationship. Has the river of change left you jaded and skeptical? Do you feel tired and worn out by the end of the day? Are you constantly trying to balance professional excellence with your personal needs and family obligations? If you’ve lost that “glow” for your job (or for life), it may be a sign you need to re-awaken your personal passion and start taking care of you. In this powerful presentation, you will learn how your core beliefs dictate your experience and how to challenge the “negative echo” around you. You will learn how to master the chaos of change and live securely amidst uncertainty. You will leave with practical strategies you can apply immediately to help you move forward professionally and personally. Grace will share a toolbox full of ideas, strategies, and mental attitudes that will stretch the comfort zone of your imagination and help you take steps towards extraordinary possibilities for excellence. Gone are the days when you worked independently to get things done. Today we all work in teams and people skills are your strongest asset. Therefore, maintaining constructive and collaborative relationships can be one of the most important factors influencing your level of success in business and in life! In this presentation, you’ll discover what can make or break relationships, how to deal with the difficult personalities, and how to navigate conflict and set healthy boundaries. You’ll also learn how to be “first brain friendly” in your communication so that you can relate with ease with almost anybody. 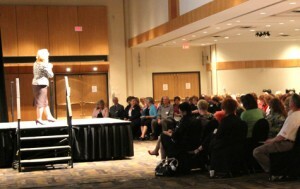 This keynote can also be expanded into a half or full day workshop. 90% of all responses to new ideas are negative. Negative people are toxic and costly and their negativity spreads affecting productivity and employee morale. What is your attitude towards change, work and can you diffuse a difficult situation? This presentation you inspire with the science of happiness and you can be mentally and emotionally resilient to negative people. You will be empowered with key mental resilience strategies, visualization techniques and emotional exercises that you can do to help turn negatives into positives and re-energize not only your attitude but your professional output as well. This presentation is ideal for women who are currently in or aspiring to step up to a leadership role. Somewhere inside you is a greater voice and vision of who you are and what your potential is. Where do you want to be and how do you want to make a difference? Grace will address the challenges facing women in the workplace and how can you navigate the obstacles? You will be introduced to various key theories and mindsets to help you address these difficulties as well as learn how to manage conflict, how to be more assertive in your communication, personal strategic planning, and how to present yourself with courage and confidence. This topic can be a keynote presentation for a conference or a half/full day seminar or workshop. For admin professionals, self-confidence not only acts like your psychological immune system, it is also the key to your professionalism, productivity and success. When you grow self-confidence, you also increase your emotional intelligence so that you can deal with stress, change, and relationships. Without a sense of Self you feel lost, unable to set boundaries or get the job done effectively. In this presentation, Grace will dazzle you with her energetic and sense of humour and inspire you with a toolbox full of “outrageous” solutions and strategies for growing your self-confidence, resilience and emotional wellbeing. You will leave feeling empowered, motivated and just a little bit taller than when you arrived! Grace has delivered this topic to international audiences always with rave reviews. Are you constantly trying to balance professional productivity with your personal needs and family obligations? If you’ve lost that “glow” for your job (or for life), it may be a sign you need to re-awaken your personal passion and start taking care of you. In this powerful presentation, you will learn how your core beliefs dictate your experience and how to challenge the “negative echo” around you so that the parts of you that you are currently neglecting will come into greater balance. For today’s modern woman, there are not enough hours in a day to get it all done. Research shows that many women are stressed and burned out and they don’t know it. Your health and happiness depends on your ability to juggle your priorities and make it all work with some time for you. At the end of the day, if you don’t take care of you, who will? In this session you will be inspired to find your core values, get grounded and let go of the unimportant. You will leave with practical strategies you can apply immediately to help you move forward professionally and personally. The Tibetans have a saying: “Tashi Deley”. Grace heard this expression on her travels many years ago and it’s translation is: “I salute the Magnificence in You”. Grace is committed to empowering women and to helping them to slow down and “salute their magnificence” in self love and self acceptance. Women feel guilty for everything. Their doubt demons never shut up. Do you make a difference or do you secretly ache for something more? Do you celebrate the miracle that is your life or are you putting in time. If you’ve ever wanted the purpose driven life; or to wake up with more passion and meaning, then put on your seat belts and get ready for Grace Cirocco’s contagous enthusiasm for life as she helps you to awaken your Spirit to outrageous celebration and purposeful living. In this presentation, Grace will entertain you with her inspirational stories and anecdotes and encourage you to take the step towards your highest potential. How to say “No” & Mean it: Assertiveness for Women Have you lost career opportunities to others because people see you as passive and ineffective? Or are you one of those women that people avoid because you have an aggressive “edge”? And what exactly is passive aggressive behaviour anyway and what can you do about setting healthy boundaries and improving your communication style. These are the topics Grace will address in this half day workshop. You will learn and get to practice 5 top Assertiveness techniques that you can use immediately at home and at the office for greater confidence and effectiveness. Grace will work with you to customize these topics for your group or event. Please Contact Grace. Grace Cirocco works directly with her clients and is not associated with any speakers bureau. On behalf of Canadian Management Centre I wish to thank you for your wonderful keynote presentation at our 6th Administrative Professionals Conference. Your presentation on Passion, Purpose and Potential – Life as an Outrageous Journey certainly struck a chord with our participants (based on the standing ovation!). Your expressive, story-telling style kept everyone captivated and gave them something special to take away. Kathryn Hodder Director, Conferences and Special Projects Canadian Management Centre I wanted to tell you how very stimulating your keynote presentation was at the Public Service Commission’s Celebration of International Women’s Day… thank you for your commitment to delivering your message to the world. And it isn’t just your message – it’s also your delivery. Lily MacDonald Canadian Coast Guard – Pacific Region Vancouver, B.C. Why Do You Need a Keynote Speaker?